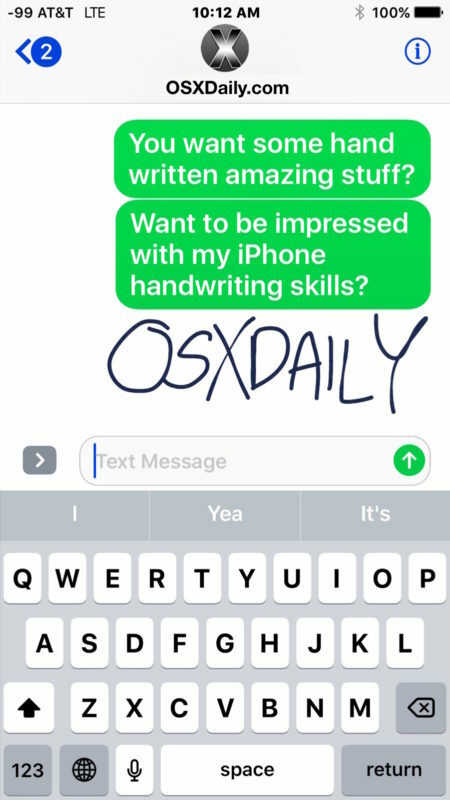 Did you know you can handwrite messages and notes in Messages for iOS 10 on your iPhone? With this feature you can scribble out a little note or sketch a simple drawing and send it along to any recipient. 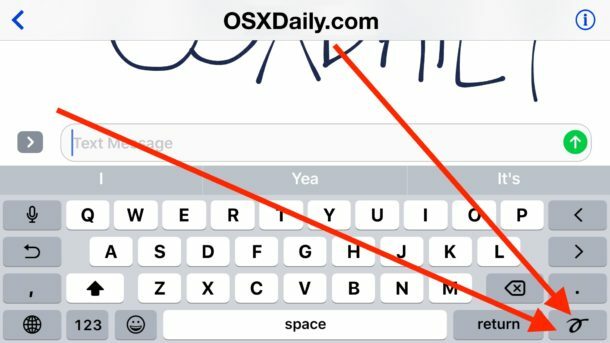 Unlike some of the more obvious new Messages features in the latest versions of iOS that have buttons and toggles immediately visible in the Messages app, the handwriting ability is a little hidden. 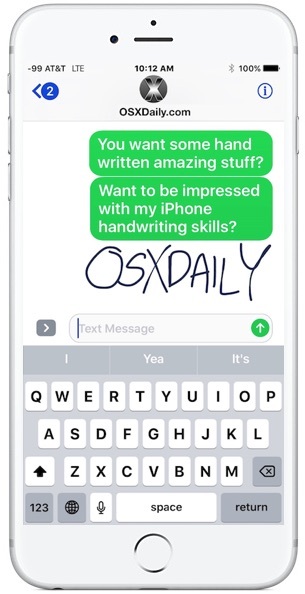 We’ll show you how to reveal the handwriting option so that you can send doodles and notes over iMessage. You’ll need a modern version of iOS to have this feature, any iPhone or iPad running anything beyond iOS 10.0 contains handwritten messaging support along with the many other new Messaging features, like iMessage stickers and effects. If you rotate the iPhone and don’t see the handwriting option automatically, you will need to keep the iPhone in the sideways position and then tap on the little squiggle button, it’s in the corner of the keyboard and kind of looks like a cursive ‘o’ or a tailed loop of some sort. You’ll also want to make sure that orientation lock is not toggled on and preventing rotation. 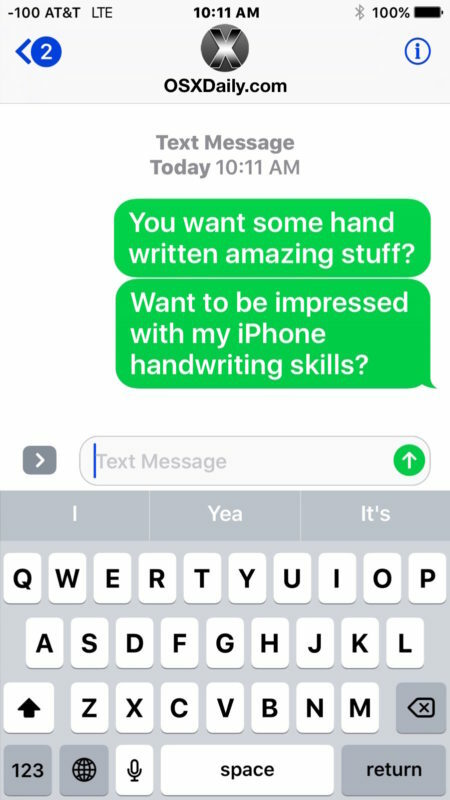 You can enter and exit handwriting mode simply by rotating the iPhone between horizontal and vertical mode while in any Message thread. The recipient does not need to be on a modern version of iOS or even an iPhone, the message will just arrive as a picture iMessage or MMS if applicable. By the way, if you want rotate the iPhone and you want just a wider keyboard like in earlier versions of iOS, tapping the keyboard button in the corner will hide the handwritten messages panel and reveal the keyboard as usual within iMessages. On the receiving end of the handwritten messages, they come across to other iPhone and iPad users as animated initially, as if they are being written out on the device, which is a nice effect. You can even save the messages as a picture file if you want to. 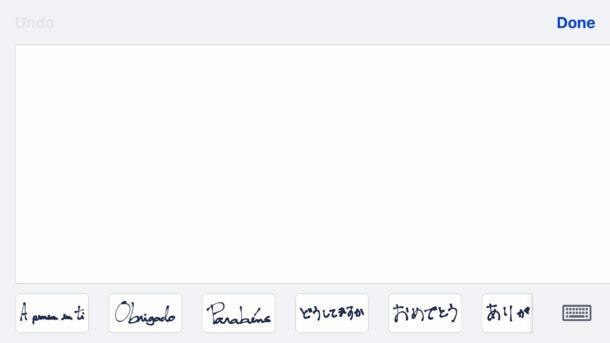 And if you’re on a Mac, you get to see the handwritten messages too, unlike many of the other iOS message effects. 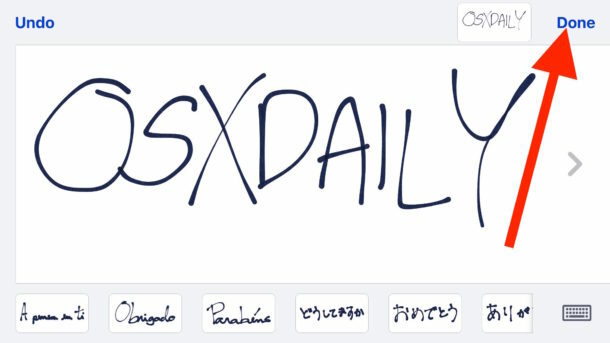 It’s a fun feature overall, and though it’s intended for handwriting you can also scribble drawings and anything else as well. This is a really innovative feature, I love the handwritten messages. It would be great if you could just have conversations back and forth in all handdwriting, replacing the keyboard with the handwritten thing. Amazing. It’s called “sending a letter,” and it’s been around for quite a while. I’ve been playing with this as soon as I found out how to use it (which is easy). However, it’s hard for me to write with my finger. I wonder if there’s any stylus or other tool to use. I have a similar stylus and I use it for an iPad. I am using an iPad pro and the apple pencil works great with handwritten notes in Messaging. I figured this out immediately when I got iOS 10.0, but it is small and sloppy. Fun but of limited utility. I have iOS 10.0.2. I have tried all of the above to find the cursive button. My phone is an iPhone 6+. Is this option available to me? You have to have the phone in landscape position. Open any conversation in your messages app and then do as indicated in step 2: “Tap into the text entry box, then rotate the iPhone into the horizontal position”. Once you’re in landscape you should automatically see the big handwriting box as depicted right below step 2 in the article. If you still see a keyboard, the cursive button should be on the bottom right corner next to the return key. BTW the landscape thing only applies to iphone. On ipad, the cursive button is always there no matter whch position the ipad is in. More importantly, how do you completely disable this feature? Sometimes after sending a message I put my phone down flat on a table and do something else while waiting for a reply. It’s so annoying when the handwriting input pops up. There appears to be no way. I do not see the use case for iMessage, so I disabled it. That does not make it go away. You might say my biggest beef with Apple is the fact that they opt us into everything without asking. Furthermore the fail to let us opt out of stuff. I bought the original Samsug Galaxy Note 1. The voice app rendered the phone almost useless because it popped up for no reason all the time. It wouls say, “What would you like to do” even if muted, and the volume setting had no effect on it. It could not be disabled. You could change settings, but they had no effect, and reset to default when you power cycled the phone. It took Samsug 6 months to fix it. That is why I bought my first iPhone. Since the handwriting toggle is in the bottom right side of the keyboard, the space bar is now narrower. So now when I’m sending a text, my thumb hits the return toggle instead of the space bar. I want to know if I can delete the handwriting toggle from the keyboard. I’ve also noticed that I’m hitting the letter ‘n’ when trying to hit the space bar. Does it seem that the space bar is not as tall as before? How do we save it, I saw at the bottom of the screen, prewritten, e.g., thank you, etc. I want to create a new one. Deleting is simple just hold for 3 sec or so and click on the “x”. How do I get rid of this ANNOYING feature?!? It pops up at the slightest movement and I hate it. Turn on the Rotate Lock to fix orientation vertically and then you will not be able to access the handwriting mode. 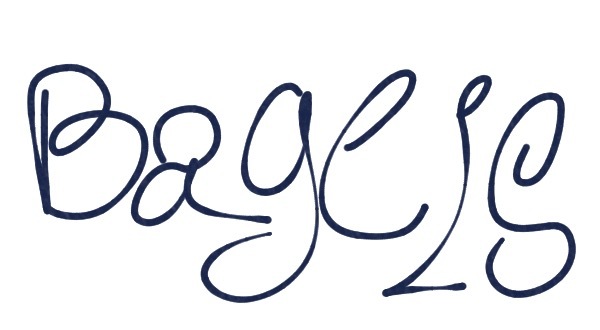 There is no way to disable handwriting mode currently so your best bet is to do that instead. Can we change it so that this doodle pad only shows up when the phone is horizontal and face down? ❤️️ The writing app since it’s more personalized. How do I get rid of this feature? I dispise this feature with all my being!!!!!!!! How do we save the drawings as one of the “buttons” (along the bottom) for repeated use as a pre-drawn option? I deleted the default choices, and seem to have accidentally saved one new one of my own, but I can’t figure out how to do it again intentionally. Anybody know? sometimes, mysteriously, the handwriting screen pops up while I’m typing in “portrait” mode…!! It’s not troublesome, but I’d like to know what makes it do that….. I suspect it’s because my FAT FINGERS have accidentally hit a wrong key (or two….). It would be nice to be able to access it on purpose, instead of having to go to landscape mode…… anyone know why this happens?